By BRregs Blog admin on November 10th 2014. Given the hesitant start to BC(A)R SI.9 and widespread reluctance of professionals to adopt new cerifier roles, recent developments at Homebond may be of interest. Vague wording and legal uncertainty, employee liability concerns and also insurance issues have been discussed in connection with the new building regulations. Recent feedback from our Blog Survey indicates widespread unease amongst professionals about the regulations, their ambiguous drafting, and dissatisfaction with supports and templates provided by their respective representative bodies to date. It appears that Homebond will shortly be launching a certifier service linked to a defects liability policy. This “one-stop-shop” will be initially targeted at the “build for sale” speculative residential sector where limited professional involvement is normal practice, and where most of the problems that led to the setting up of the revised building regulations occurred in the first place. “Over the last two weeks I’ve had conversations with two representatives of Homebond and two, very different, house builders. The conversation with Homebond was sparked by a discussion with a long established builder. He is not a client of mine. He told me he has a small development of seven houses about to go on site and I asked how he was managing with certification. He told me his development is one of a few ‘trial’ developments where Homebond are providing a ‘full’ service including the provision of services as the Assigned Certifier. His firm has been with Homebond for many years and has a good relationship with them. In relation to costs, he said that Homebond were providing engineering services for the foundations and a complete Homebond service including Assigned Certifier and the normal Homebond costs for an all in figure of €2,000 per house (which includes €250 for foundation design!). I subsequently spoke with a client of mine who is a substantial and again long established house builder who confirmed that this was a service Homebond intend to provide and I will be discussing this with him over the coming week or so. In order to corroborate this I spoke with two representatives of Homebond, with whom I am currently involved on a housing development. They both, individually, confirmed that this was service already being provided to some of its clients. They said they were careful to select house builders they knew well but intended this to be part of their services offering in the future. The logic was, as they already provide the insurance and inspect the building development at critical stages, then they would expand the service to include Assigned Certifier and also provide engineering services (for foundations in particular). I asked about the process as the Assigned Certifier has to be an individual as opposed to a corporate. I was told that they ‘have an Assigned Certifier in the office’, who is fully insured. So, in this scenario, Homebond will end up controlling the implementation of the Building Regulations, standardising details and driving architects from site for housing and diminishing the potential for innovative design. Assigned Certifier services along with defects liability policy for under €2,000 per dwelling unit? Sounds too good to be true. This news will be good news to speculative housing developers, who are keen to minimise the costs of the new regulations on their projects, and wish to retain more control of the project with limited professional involvement and minimise costs. It’s likely given the reservations some professionals have been expressing about the regulations, that Homebond may well be busy employed by clients of reluctant professionals as Assigned Certifier sub-contractors! Its hard to see how consumers may be as well served as house-builders though. One of the drawbacks we have noted with the self-certificaton model adopted by the Department is that it relies on private insurance (Professional Indemnity policies or group schemes like the one proposed) as the primary means of redress in the event of a defect post-completion. The problem with any insurance scheme is that it can be either wound-up, or exclude particular items (like pyrite) and policies evolve on the basis of claims made. In the wake of pyrite claims nationwide some properties were not covered by Homebond policies and are being repaired with public funds. We have noted the cost of pyrite remediation in other posts at €780m to date. Other specialist sectors like passive house designers may find more innovative details will not be acceptable to panels of private (Homebond) inspectors, and the ongoing development of technical standards and details may take a back seat with conservative eyes looking over designers’ shoulders. 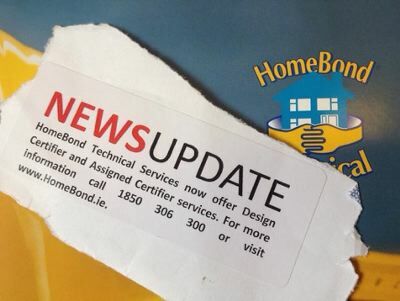 The other impact, of course, is that this new Homebond service may set the market rate for Assigned Certifier services down below €2,000. Professionals who are adopting the new roles may find SI.9 fees seriously impacted by this development. With the limited likelihood of site inspections by a genuine third party in the shape of the Local Authority, and the competitive price offered, will this end up being the main defence against repeating the mistakes that were made in the boom? Click on link for Homebond Training Brochure: Pdf link. Click on link for information on course dates, locations and fees: Pdf link. The Irish construction culture is ‘What can we get away with?’ in a race to the bottom, not what is the right thing to do and how much should that cost? Home bond inspected many of the buildings constructed during the boom. How did so many homes pass the test/inspections when so many homes are poorly insulated, poorly fire stopped and are infested with mold. Are we going back to business as usual? Insurance must cover everything down to the hinges supporting the doors otherwise simply put your money in the bin. The thought of Homebond being the arbiter of compliance based on the fact that they “have a man in the office who is fully insured” doesn’t fill me with confidence. Insurers go into business to make money. I wonder what profession their “man in the office” belongs to. My previous comments on insurers and their ways refer.